Since June 2011, Chartiers Custom Pet Cremation has sponsored pet first aid introductory and certification classes and dog aggression classes in Bridgeville and surrounding communities in the south and west of Pittsburgh. Although there is usually a charge for attending these classes, Chartiers Custom Pet Cremation is offering these sessions free of charge in an attempt to offer families the skills they can use to help save the life of their dear pet. Even though the classes are free, because of limited seating and preparation of any materials from the instructors you need to RSVP for each class by calling Deb at 412-220-7800. For information on upcoming classes, please check here for dates and times. If you would like to be the first to know of any scheduled events, sign up for our monthly email newsletter. 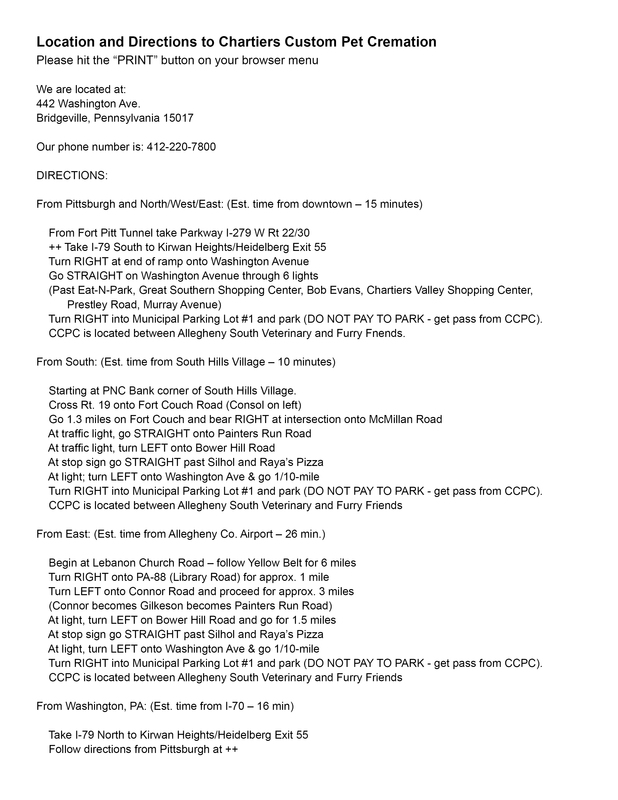 You may also find information by friending us on Facebook or you may call Deb Chebatoris at 412-220-7800. North Strabane Municipal Bldg., Noon to 2:00 p.m.
Read below about what this class offers. Great for pet parents who want a basic knowledge of what to do for the most common emergency situations. 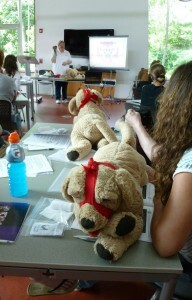 Why Pet First Aid Classes? Is there anything sadder than losing the companionship of your pet to death? Yes, when I need to work with a family whose young, healthy pet has succumbed to an accidental death, it is a double tragedy. Not only does the family experience the loss but there is a lingering feeling that “if only…” they would have done this or that, the death may not have occurred. I have worked with families whose pet died after being caught and choked by the collar, who suffocated in a potato chip bag. It is difficult enough when we lose a pet who has lived a full and long life, but it is practically impossible to say goodbye when the pet is only a few years, or even months, old. The grief is palpable in these situations, with families saying they had such plans for the life cut drastically short. Recently, I had to work with a number of families who found themselves in this circumstance and wondered if there was anything that Chartiers Custom Pet Cremation could do to prevent such tragedy. As providence has often revealed the answer to my problems, in walks Karen Sable. After we talked about arrangements for her dear departed Snowball, our conversation revealed that she had chosen to intensify her involvement in animal welfare and became a certified pet CPR and first aid instructor. Through discussions, the two businesses, Chartiers Custom Pet Cremation and Pet Emergency Training LLC, have joined forces to help families learn what to do in the case of a pet life threatening situation. With the number of weather related problems we have experienced during the past several years (floods, tornadoes and large snowfalls with power outages), the western Pennsylvania area has not been spared the impact these conditions can have on our beloved pets. Both classes will help families be prepared for such occurrences. There will be no charge to participants attending the classes offered by Chartiers Custom Pet Cremation, however space is limited so participants must register to attend. Registration is being taken by Deb at 412/220-7800. Additional classes are planned for other locations throughout the Pittsburgh area. Last year while Deb was walking her two dogs, Wilson and Colby, in their own neighborhood, they were suddenly and unexpectedly attacked by a larger, aggressive dog. Both Wilson and Colby had injuries requiring treatment. While Deb was unhurt she understood that this could have been a tragedy and vowed to organize Dog Aggression classes for dog owners and others so that people would know what to do when approached or attacked by an aggressive dog, and owners would be able to identify the signs of aggression and calm an aggressive dog. Two different classes are offered in this area, one for handling other dogs and one for handling your own dog. Handling Other Dogs: Dog Aggression and Dog Bite Prevention instructs how to help prevent dog bites and how to handle an aggressive dog that is not your dog. Penny will also offer some suggestions on how to work with aggressive dogs, but most of the class will focus on dealing with example situations. Handling Your Dog: Shy, Fearful or Aggressive, Understanding Your Dog’s Trigger instructs how to handle your own dog’s aggression. Penny will also discuss best practices when walking your dog. Read about our classes in the Post-Gazette’s Pet Tales or listen to our radio commercial about our Dog Aggression Education classes. The file is an MP3 audio only and should play on most computers and mobile devices. NOTE: Even though the clases are free, because of limited seating and preparation of any materials from the instructors you need to RSVP for each class by calling Deb at 412-220-7800. No Dog aggression classes are currently scheduled. To be notified for upcoming classes and events, check back or sign up for our blog, Animus, to receive announcements in e-mail, friend us on Facebook. 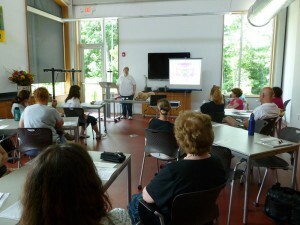 If you have a group or facility and would like to host a class, please call Deb Chebatoris at 412-220-7800.